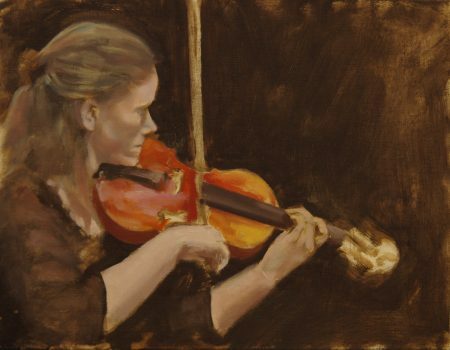 This timeline of images (a portrait of my good friend, concert violinist, Sarah) demonstrates my normal process for painting portraits. 1. If possible I like to do some preliminary sketches before starting on the painting. 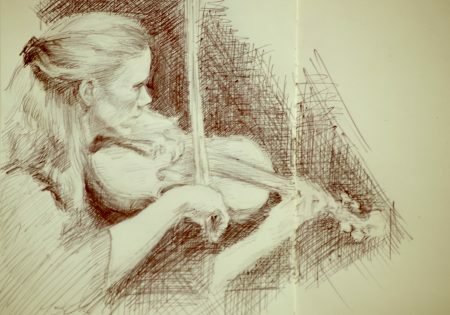 In this case there is just one sketch … but that had already been preceded by several (unsuccessful) other drawings and paintings from earlier sittings so I had already got in a useful amount of practice before beginning this picture. 2. 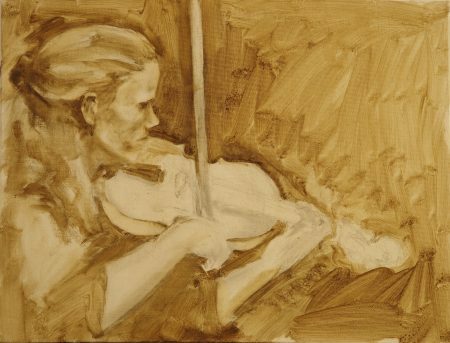 Start sketching the painting on canvas with thin paint which, for portraits, my choice is usually raw umber. In this case you may notice a charcoal under-drawing, which is rare for me. 3 – 4. 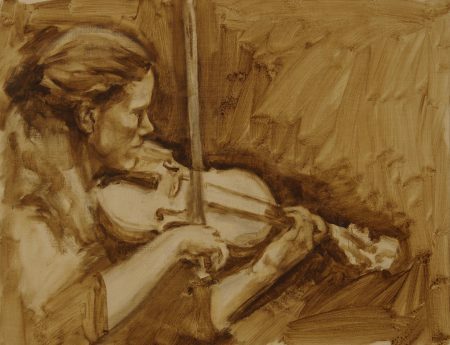 Refine shapes, establish tonal contrasts, still just using raw umber. Trying to satisfy myself that I will eventually be able to make it look like the subject (and that all those deceptively and devilishly tricky curves of the violin are reasonably right). 5 – 7. Start applying colours. 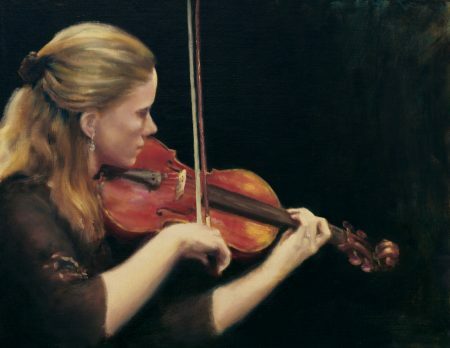 For portraits – especially female – I usually prefer to build up the colours slowly over many layers. 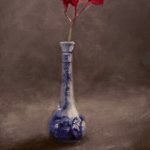 I think this gives a more natural result and allows greater control over colours, shapes and contours than is possible (for me at least) by mixing and applying paint thickly in one go. 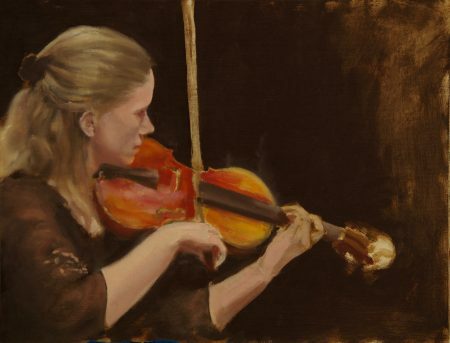 The violin is also rather distinctive, and well known to the violinist – who would be quick to notice (and point out!) any inaccuracies in shape or colour. 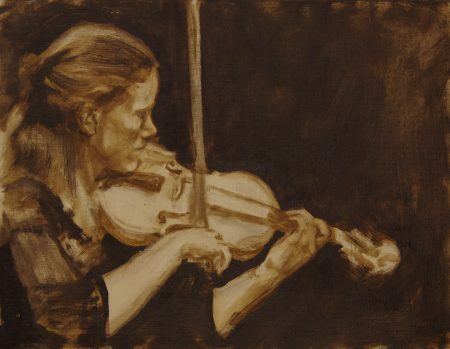 So this is really a double portrait – the violinist and the violin. These stages are a matter of building up colours, building in depth and constantly adjusting and tweaking. 8. Continue refining, add in a few details and finishing touches and breathe a sigh of relief.